When the Irish Cruising Club was established in Glengarriff at the head of Bantry Bay on Saturday 13th July 1929, the friendly gathering of the crews from a modest flotilla of five decidedly varied sailing yachts – mostly small craft by today’s standards - had several clearly defined purposes in mind writes W M Nixon. Certainly, they wanted to engender greater interaction and cohesion among Irish cruising enthusiasts - and greater respect too, as the high-profile racing community tended to look down on them with some disdain, for they saw cruising people as being no more than ordinary sailing folk who simply didn’t race. So in order to give more credence to the organised aspects of their life afloat, they planned to produce an Annual filled with logs of the cruises they’d achieved each year in order to give a more complete picture of the new ICC’s activity. But for many members, the new club’s most important objective was to be the researching and publication of detailed sailing directions and harbour guides for Ireland’s most popular cruising coasts. Until then, information about the more remote parts could only be found in Admiralty Pilot Books which were aimed at ships rather than smaller craft, or else it was in the realms of that precious commodity “local knowledge”, often jealously guarded by those who had it. In the growing mood of amateur enthusiasm for cruising, self-reliance was a central factor, and that was dependent on having ready access to inside information. Founding member Harry Donegan of Cork, who more accurately could be described as the leading ICC inspirer, had been one of the seven entrants in the inaugural Fastnet Race of 1925 with his 15-ton cutter when he’d finished third overall. But as a sailing polymath with much cruising experience, he’d been creating Sailing Directions for southwest Ireland since 1912, when he had also first aired the idea of an Irish Cruising Club. However, the outbreak of the Great War in 1914 put that notion on hold until 1922 when he was developing the idea further with his fellow cruising friend Billy Mooney of Howth. But the War of Independence followed by Partition and the Civil War had created little space for such ideals, so it was 1929 by the time the club finally came into being. Yet through all the delays, the aspiration for the production of reliable cruising guides to Ireland by voluntary effort for general publication remained high on the list of priorities, and today with the entire coast covered in two comprehensive volumes edited by Norman Kean of Courtmacsherry with his wife Geraldine Hennigan providing invaluable backroom support, the two books have gone through more than a dozen editions, and they continue to give great service for visitors and locals alike. Indeed, such a steady role is played by these Directions that there’s a danger we take them for granted, so it needs an outside view to puts their importance in perspective. We’ve received that twice already this year in the accounts, by leading Inland Waterways enthusiasts Paul Scannell and Mary Healy of Galway, of their first venture round Ireland last year in the 1977-vintage Broom Ocean 37 motor-cruiser Arthur - normally a boat associated with the Shannon, but one which is capable of a round Ireland cruise if you’re careful with reading the weather. They told of their experiences at the Irish Sailing Cruising Conference at Lough Ree YC in February, making the point that having the ICC Directions is essential. And then in the recently-published Spring 2019 edition of the IWAI’s Inland Waterways News, with Paul’s fascinating account of their very thorough preparation, planning and execution of this voyage, there are again several references to the indispensable assistance they found in the ICC Directions. ICC beneficiaries – inland waterways cruisers Paul Scannell and Mary Healy with their vintage 37-footer Arthur found the ICC Sailing Directions to be “indispensable” during their round Ireland cruise last summer. That of course was the intention of those founding fathers 90 years ago in 1929. But in an era when the ICC has acquired a considerable extra glamour with the recent organisation by western member Peter Haden (he’s from Ballyvaughan in County Clare) of an extremely well-supported Cruise-in-Company in northwest Spain, it is timely to be reminded that the very useful work put in train by the club from the start is still being maintained. So much so, in fact, that as Norman Kean and Geraldine Hennigan were with the fleet in Galicia with their Warrior 40 Coire Uisge, while they were out there they did a spot of local surveying in order to provide better information about some previously under-utilised channels. In an era of centralisation and the seemingly inevitable spread of professional administration, the ICC is the very model of a de-centralised, all-Ireland organization based on voluntary effort. The office of Commodore rotates around the four regions, and is currently held by Stanton Adair of Belfast Lough, but both the Honorary Secretary Alan Markey and the Vice Commodore Tom Fitzpatrick are based in Howth, while other flag offices and committee places are spread throughout the four provinces in a way which partially reflects the membership distribution, yet also encourages the growth of membership numbers where previously they’d been sparse. But it is the specialist positions which are the engines of the club, and best reflect its countrywide nature. The all-important Annual is currently edited by Maire Breathnach of Dungarvan, and she has raised it to a quality which comfortably rivals many professional publications, despite being for a membership of just 550. As for communication with members, the ICC Web Editor is John Clementson who lives on the shores of Strangford Lough, but the editorship of the cherished quarterly newsletter – again of magazine standard – is done by Alex Blackwell, who is likewise a shoreside dweller, but this time on the Atlantic seaboard at Clew Bay in Mayo. All these tasks successfully maintain communication among a membership who still tend mostly to do their cruising in summertime in the northern hemisphere, but there are always some others somewhere on longer voyages. In other words, most of the activity of ICC members would be invisible were it not for the fact that they’re highlighted with the annual awards, presented each year at the AGM, which is the only event where ICC members are obliged to be in Dublin. While fellowship, conviviality and a shared love of boats and sailing across oceans, or along coastlines familiar or new, is enough to bind the club in remarkable ties of friendship, there is one occasion every year when they get together simply to have a party, meet new members, and welcome flag officers from the international matrix of cruising clubs. That occasion is the Annual Dinner, whose organisation rotates round the ICC’s four regions, and for 2019 it fell to the Southern Committee and Rear Commodore Lonan Lardner of Waterford to take on the mantle. It’s quite a challenge, but the cruising folk of the south have the advantage of having Killarney in their region, and there’s little that the smooth-running hospitality industry of Killarney didn’t know last weekend about looking after a dinner for 247 people. In the midst of an active weekend of multi-activities which saw some ICC members disappear up mountains (don’t worry, they came back down again), others went on historical tours. As for our little group of special friends – with more years of combined membership between us than we care to count – we went off on a tour of the Ring of Kerry – mercifully uncrowded for it was the weekend after St Patrick’s Day – and took in harbours and happy watering holes, and saw the incomparable Derrynane at its pristine best (not one boat of any kind in the anchorage, first time I’ve ever seen it like that), and then relaxed in the history-laden comfort of Parknasilla. Derrynane in high summer. This tiny anchorage in West Kerry is unrivalled for its links with notable sailors, as those connected with it include Daniel O’Connell, Lord Dunraven of America’s Cup fame, pioneering world circumnavigator Conor O’Brien, and current Irish international offshore superstar Damian Foxall. That set us up nicely for the scenic route back to Killarney from Sneem up to Moll’s Gap, and then it was into the scrum of the dinner. With 247 present and on top form, you’re going to meet and greet an impressive number of folk, but – when anything resembling conversation is possible - is never quite going to take the course expected. Thus I found myself sharing an enthusiasm for rudders which fit neatly under the hull for maximum endplate effect with the charming Brad Willaur, Commodore of the Cruising Club of America, a line of thought inspired by my very high regard for the classic Jim McCurdy-designed 48-footer Carina aboard which Brad has raced with current successful owner Rives Potts. When Carina first came to Ireland brand new in 1969, she was in the Transatlantic Race to Cork as part of the buildup to the Royal Cork’s Quarter Millennium, and she then went on to do the Fastnet of that year. The word is that she’s coming back for this year’s Fastnet as part of her Golden Jubilee celebrations, but meanwhile I recalled that one of her crew for that 1969 Transatlantic passage was a very youthful Ron Cudmore, and sure enough there was Ron in Killarney, like us all not quite as young as he used to be, yet still very definitely Ron Cudmore. But in terms of age defiance the total star of the show was his brother, sailing superstar Harold Cudmore, who was there to mark an extraordinary number of years as an ICC member, for in the days of his youth the ICC had a strong Crosshaven and family bias, and Harold got in as a mere lad. But nevertheless, he has defied the years so well that he looks about ten years younger than the number of years he has been in the club. He was celebrating with Jack Wolfe, who at 95 is the ICC’s senior member, with a unique direct link of having been aboard Saoirse with Conor O’Brien in 1938. That saw the conversation swing into the unlikely associations which the ICC membership brings up. Who would have thought, for instance, that rugged Arctic voyager and Irish traditional boat enthusiast Paddy Barry would have started sailing with fellow UCD engineering student and subsequent International Dragon and superyacht owner Mick Cotter? Yet they did that by buying an oldish 505 dinghy and using it for camping cruising, one of their more noted ventures being a fast unaccompanied sail from Roundstone in Connemara out to Kilronan in the Aran Islands. On this being mentioned to Harold, he immediately recalled that the boat in question had originally been Joe Woodward’s Dotie Pet, one of the most successful of the Crosshaven fleet of 505s, and then almost exactly on cue, Joe Woodward himself emerged from the ICC Killarney melee with a request. For a long time now, he has been a summer fixture of the Galician coast with his Salar 40 Moshulu III. But when he was clearing out the boat last season, he found a rather special Irish ensign. It seems that when Moshulu first arrived in northwest Spain many years ago, his first anchorage to get his breath before entering port was the Iles des Cies off Vigo. Having crossed Biscay, suddenly his little Irish ensign seemed totally inadequate. But it so happened that our beloved Sail Training Brigantine Asgard II was anchored nearby. So Joe hopped in his dinghy and went over and asked if by any chance they had a spare ensign of decent size. They had and more, and they lent him one. So though Asgard II may now be gone, Joe Woodward of Cork has one of her ensigns, and he’d very much like to see it being used for some useful and preferably charitable purpose. In a hectic weekend like this, there’s bound to be the occasional hiccup, and I managed a beauty by crashing a flying boat. We were travelling down to Killarney in convoy with the legendary Dickie Gomes, voyager extraordinaire, and when a boring rainbelt moved in, my mother-in-law’s daughter cleverly suggested we let it pass through by visiting the Flying Boat Museum at Foynes. She knew that Dickie’s father used to be General Manager of Short Brothers & Harland in Belfast where they’d built the famous Sunderland Flying Boats after the company had been moved lock, stock and barrel from Kent from 1938 onwards in order to locate it further away from the Hitler unpleasantness. Cruising boat with a difference – Short Sunderland flying boat getting airborneIt’s a fascinating setup, that Foynes museum, complete with a full-size replica Boeing B314 flying boat, aka the Pan Am Clipper, but there are also flight simulators in which you could be in any type, and we decided we were on which Dickie had flown from Belfast Lough. Neither of us did. Nobody in Killarney did except Henry. But the sailing barge Lady Daphne was built by Short Brothers of Rochester, Kent in 1923 at a time when demand for flying boats was very limited. The thought that the Short Sunderland Flying Boat is a relative - however remote - of the classic Thames sailing barges is something that takes a bit of getting used to. Yet it was just one of many ideas you have to take aboard in short order at an ICC Dinner. However, an underlying theme is that everyone is thinking of the Tricentenary of the Royal Cork Yacht Club next year. The word is that at least 17 significant American boats are coming across. Heaven only knows how many will join from Europe for the Great Gathering. Most of us still can’t grasp just what 300 years really means. But there’s no doubt many people are determined to get their heads the very idea, for it is going to be something extra special in 2020. The UK based Cruising Association (CA) Regulations and Technical Services Group (RATS) understands that Belgian authorities will continue with the agreement for UK pleasure vessels visiting Belgium that they still have to use our red diesel in the engine fuel tanks for propulsion, certainly for this year. The conditions are the same as before, in that all diesel purchased prior to departure from the UK to Belgium, or other EU maritime States' marinas and ports, must pay the full 100% duty (and not any lower duty rate) on all the fuel and that it is recorded on the signed invoice for the purchase. This invoice must be on board the vessel (such as with the boats log) in the unlikely event any inspecting Customs official should wish to see it as proof of the duty payment. "All diesel purchased prior to departure from the UK to Belgium, or other EU maritime States' marinas and ports, must pay the full 100% duty"
The agreement was successfully used last year and, should there be any change to it by the Belgian authorities, they have promised the Regulations and Technical Services Group a guarantee that they will be informed of this in good time so that the Cruising Association can share the details with CA members and the wider sailing community. This agreement will carry forward throughout the 2019 sailing season. For peace of mind, and if owners have any concerns about making a trip, they can ring the staff of the first marina they are calling at to confirm they will have no problem with their visit. Cruising and its organisations move at their own serene speed, and when Donal Walsh of Dungarvan received Irish Cruising’s supreme trophy - the Faulkner Cup - in February, it was recognition by his peers of an outstanding and seamanlike achievement made in the summer of 2018. 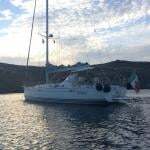 Sailing the Ovni 385 Lady Belle and crewed throughout by Clare Morrissey, with others on board from time to time, Donal Walsh made a seamanlike odyssey of 80 days and 3,450 miles to seven countries. He returned with a myriad of memories and much information which he has processed for others in the best traditions of cruising, with a properly kept and highly informative log. Dungarvan in the west of County Waterford is in some ways one of Ireland’s best-kept secrets writes W M Nixon. It’s big enough to be considered a real town by Irish standards – it’s the County Town too - yet it isn’t so big as to seem impersonal. There’s a real sense of community, while it’s set in the midst of quietly beautiful scenery beside an array of spectacular hills and mountains. And though the more sheltered parts of its estuary harbour have a tidal element, it’s home to a significant fleet of boats based around the thriving Dungarvan Harbour Sailing Club. Yet in times past Dungarvan did not figure high in any listing of cruising destinations, as boats on passage along the south coast saw it as being a long diversion from the direct route to and from Cork Harbour, when a very handy overnight berth would be available if you anchored at the entrance to Dungarvan Bay, in the sheltered spot immediately west of the busy little fishing port of Helvick. And as for carefully finding your route all the way into Dungarvan if the tide suited, it seems that any chance of a convivial evening with local cruising enthusiasts would be remote, for once summer arrives, they’re all gone - gone far away to distant parts on fascinating cruises of their own. Or at least that was the impression gained at yesterday evening’s AGM of the Irish Cruising Club, chaired by Commodore Stanton Adair from Belfast Lough, and hosted by Howth Yacht Club. Under the “homeless” 1929-founded ICC’s rules, the Club’s AGM is always to be held in Dublin, though these days with Home Rule the mood of the moment in Fingal, you’d wonder if Howth is truly a part of Dublin at all. Be that as it may, last night it was Dungarvan which was the talk of the town, for not only had Donal Walsh of Dungarvan been awarded the top prize, the Faulkner Cup, for his fascinating cruise to seven northwest European countries with his Ovni 385 Lady Belle, but in receiving it he was succeeding his sister Maire Breathnach as the awardee, as she got the nod in 2017 for her cruise to northeast Greenland with her husband Andrew Wilkes in their 64ft gaff cutter Annabelle J. Finding any continuity between an Arctic cruise in a hefty classically gaff-rigged cutter, and a detailed largely coastal venture in an ultra-modern alloy-built cruising sloop with a lifting keel, may seem like quite a challenge, but that is typical of the exceptional diversity which the wide-ranging members of the ICC are achieving these days. In the past couple of decades, they’ve seen several boats go round the world, they’ve seen transits of both the Northwest and Northeast passages such that the Arctic Circle has been circumnavigated, they’ve seen voyages to the far south, deep into Antarctica, and they’ve seen island-hopping explorations of the Pacific. But equally they’ve seen increasingly detailed cruises of the Mediterranean and Europe and the nearby islands of the Atlantic, and for 2018, adjudicator Dan Cross of Crosshaven – a sailing and cruising man of exceptional experience – decided that it was time the best of these got the top award. Donal Walsh’s 80-day 3450 mile cruise with Clare Morrissey and others aboard Lady Belle, from Dungarvan north to the Hebrides of Scotland, then on to the Orkneys, Shetland, Norway, Sweden, Denmark, Germany, The Netherlands, Belgium, France, the Channel Islands, Brittany and Cornwall before the final haul across the Celtic Sea back to Dungarvan, fitted the bill to perfection. While Lady Belle enjoyed some of the great weather of June and July, the sheer length of time which a 3450-mile cruise of this type involved inevitably saw them experience gales – 12 in all – and the weather was well broken when they returned home in August. They came back to find that June and July in Ireland had been perfect weather, ideal for cruising home waters, so not surprisingly the other trophies allocated by Dan Cross see an emphasis on those who took best advantage of this, with the Strangford Cup for an alternative best cruise going to Derek White of Strangford for his leisurely and very convivial summery circuit of Ireland with his wife Viv on their vintage Fastnet 34 Ballyclaire. A perfect Irish summer day in the making. Early morning for Derek & Viv White’s Fastnet 34 Ballyclaire (left) on the convenient pontoons at North Harbour, Cape Clear, with Brian & Eleanor Cudmore’s Bavaria 42 Ann Again ICC on right. Photo: Derek White. Happy skipper – Derek White gets past the Strangford Bar Buoy. The fact that the northerners take their holidays in July while those in the south see August as the holiday time worked in the northerners’ favour with 2018’s weather patterns, as the former got idyllic conditions for several detailed cruises in Irish waters. Another Strangford Lough boat – Peter Mullan’s Sun Odyssey 12m Oyster Bay – simply took advantage of the good weather to cruise gently to West Cork and back with the Voyage Purpose being an inspection of the historic ketch Ilen nearing completion of her restoration at Oldcourt near Baltimore, and he won the Glengarriff Trophy for his charming write-up. As it happens, Ilen figured again in the awards, as the ICC’s Western Committee allocated the Aran Islands Trophy to Gary MacMahon of Limerick for his inspirational leadership of this project. But meanwhile Peter Mullen’s easy-going cruise produced the best of the many 2018 sunset images in the ICC Annual, though perhaps you wouldn’t immediately guess its location - it was taken in the workaday port of Arklow. Meanwhile, far to the northwest, Paul McSorley and John Gray voyaged from Lough Swilly out to Rockall and back under sail only in the Westerly Falcon 35 Viking Lord, “sail only” being a requirement as they wished to qualify for the Azores & Back Race. When they finally got to that distant and lonely rock, like everyone else they were surprised by just how small it is. But to prove they’d been there, they took an Irish product placement image of themselves with Rockall between them, framed by a packet of Tayto Crisps from County Meath and a bottle of Belfast Ale. Last night, they received the ICC’s Rockabill Trophy for seamanship for a job well done. One of the ICC’s most senior and significant trophies is the Round Ireland Cup, and for 2018 it goes to one of the club’s most senior and significant boats, the 1890 Cobh-built 32ft cutter Winifreda, owned for generations by the Villiers –Stuart family. Everyone knows her as Winnie, and she’s all boat - the biggest 32-footer you ever saw - for she was built of double-skinned teak as a workboat in order to transport gunpowder and ammunition from the naval base at Haulbowline in Cork Harbour out to the forts at the harbour entrance. It’s said that her hull planking is of such high quality that none of it has ever needed to be replaced, which at 129 years is quite something. But above deck and within the hull, she has been very cleverly altered to become a comfortable Bermudan-rigged cruising cutter, and in this form she has cruised thousands of miles. The 1890-built Winifreda in party mode at Helvick in 2018. A hundred years earlier, she had worked from this West Waterford harbour as a fishing boat, and before that she was a Naval Ammunition Carrier in Cork Harbour. These days, her custodian is Gary Villiers-Stuart and he has her based at Ulva Ferry on the West Coast of Mull in Scotland. But as she has been in the family since 1918 and was based for many years at the ancestral territory in West Waterford, he reckoned the centenary of ownership year of 2018 merited an anti-clockwise circuit of Ireland with the emphasis on West Waterford and particularly Helvick, where Winnie was worked as a fishing boat before she eventually was converted to a cruising cutter. It was some cruise, challenging at times and hugely sociable when special ports were reached, and the entire project exactly fits the Round Ireland Cup purposes. Not everyone stayed in Ireland to avail of the good weather. Peter Fernie of Galway with his little Moody 27 Mystic decided a season or two in the usually more summery weather of Galicia had become a priority, but after a seamanlike crossing of the Bay of Biscay direct from Dingle, he arrived to find the rain in Spain while a call home revealed that summer had come. But he very worthily received the Marie Trophy for the best cruise by a boat under 30ft donated by northern skipper Michael McKee, who in turn was presented with the Wright Salver for his years of service (since 1962) to the club. And meanwhile back in Galicia, summer duly reasserted itself, but even so several ICC boats which have been based there since the club’s Galicia Rally in 2016 decided it was time to cruise home in order to be comfortably in place for the Royal Cork’s Tricentenary in 2020. That in turn presented the adjudicator with a selection of fine cruises well worthy of trophies, but the main choices had been made, and in order to reflect the wide scope of the Annual’s contents, Dan Cross recognised cruises by members in non-club boats in more distant areas, including one by John Duggan into eastern Sweden (the Wild Goose Cup) while the Fingal Cup for the log which the adjudicator most enjoyed went to Ed Wheeler for his entertaining account of a jaunt through the remote fjords of southwest New Zealand. Much nearer home, the business of boat delivery after a successful purchase in Europe is part of ICC life, and second-generation ICC member John O’Rahilly of Dun Laoghaire made such an efficient yet enjoyable job out of bringing his newly-acquired Wauquiez Gladiateur home from The Netherlands in just eight days that the adjudicator reckoned the project merited the Fortnight Cup, a senior ICC trophy which dates back to the days when people had jobs of regular hours, and with clearly-defined holiday periods. Two of the ICC’s most eminent early members were designer-builder John B Kearney and 1925 Fastnet Race veteran Harry Donegan, and they are remembered with the John B Kearney Cup - an open award for an outstanding contribution to Irish sailing – and the Donegan Memorial Trophy, in the gift of the club’s Eastern Committee to honour someone special in their region. The John B Kearney Cup went to Gregor McGuckin, hero of the Golden Jubilee Golden Globe race for his inspiring attempt to rescue an injured fellow-competitor when he himself was sailing under jury rig after dismasting in the Southern Indian Ocean, while the Donegan Trophy celebrated the many achievements of former ICC Commodore Peter Killen of Malahide, whose cruising has included outstanding ventures both to the Arctic and Antarctic, while at home he has been a tireless worker behalf of both the club and the RNLI. However, for those just new to the game, the ICC offers encouragement to writers of their first log for publication in the form of the Perry Greer Bowl for the best such effort, and for 2018 it goes to Jim O’Meara of Cobh for his informative account of a detailed anti-clockwise circuit of the Bay of Biscay from northwest Spain, with his Jeanneau 37 Second Chance now laid-up in Brittany, poised to sail for home in the summer of 2019. In all, there are 28 hugely varied cruising logs covering thousands of miles and dozens of cruising grounds in the new ICC Annual, the second one to be edited by Maire Breathnach (it’s Dungarvan again…), and she does it with style and skill. One of the most attractive of her additions to the contents is a delve into the archives of cruises past, and this year’s is a gem – the 1961 Round Ireland Cruise from Carrickfergus by the tiny 18ft Belfast Lough Waverley Class keelboat Durward, beautifully written up as “The Time of Our Lives” by Kevin MacLaverty, who was crewed by his younger brother Colm and Michael Clarke. Kevin and Colm are alas no longer with us, but Michael Clarke at 78 is still very much part of the sailing scene – at 78 he is Admiral of Lough Erne Yacht Club, Father of the J/24 Class, and a couple of years ago he was cruising round Ireland again, this time with Rob Henshall ICC in the Endurance 35 ketch Inspiration from Lough Swilly. Michael Clarke came up with the goods for Maire Breathnach to beef up the 1961 log of Durward, and it’s a treasure trove of memories from 58 years ago. In those days, detailed cruises of Ireland’s west coast were a rarity, and for many sailors from elsewhere, the occasionally-sighted currach and even rarer Galway Hookers were much more a matter of wonder than they are nowadays, when new boats of all sizes to the traditional designs are being built, and people such as ICC member James Cahill of Westport have gone to the trouble of assembling a collection of 14 small craft to cover every known currach type. But back in 1961, there was a pessimistic assumption that such boats would disappear in the face of progress, and even though Durward met her first currach in Blasket Sound, with the little black boat sailing in from the then-inhabited Great Blasket Island, within three years the last islanders had left to live on the mainland. Lough Ree Yacht Club at Ballyglass, where the spacious waters of the great Shannon lake start to narrow back to river size for the passage south through Athlone, is already well into planning for its Quarter Millennium in 2020. Founded in 1770, its history ranks it second only to the Royal Cork YC of 1720 in the global seniority stakes. But on Saturday, when it provided the hospitable centre-of-Ireland location for the fully-booked all day Irish Sailing Annual Cruising Conference organised by Gail MacAllister, the focus was very much on the present and future of cruising. A well-chosen range of topics and speakers absorbed the attention of a sailing and boating population which may not grab the headlines in the same way as the racing brigade, but countrywide their numbers are probably greater, while participants included racers who cruise with equal enthusiasm. Lough Ree YC Commodore Garrett Leech and Irish Sailing President Jack Roy opened the varied proceedings, their own experiences setting the tone. The Leech family is synonymous with active Shannon cruising and racing, and Garrett’s brother John is Commodore of Lough Derg YC. As for the President, while he may be best known for his many competitive participations in a variety of boats and continuing race officer duties, these days he is also spreading his cruising horizons with the fine Hallberg Rassy 46 Tangaroa. Thus he is personally well aware that though the legislation for the Irish version of a Small Ships Register was enacted as long ago as 2014, Irish Sailing is still working on behalf of those whom it represents to get it up and running. This lack of priority given to some official interactions with the recreational boating community was echoed by one of the afternoon’s speakers, Irish Cruising Club Sailing Directions Editor Norman Kean. He has been ICC Directions Editor since 2005, but for the last three years he has also been on the Irish Sailing Representation Group, specializing in the problems with the official attitude to the changed situation in regard to use of red or green diesel, and he brought the conference up to date on developments there which - to say the least - are slow. However, if there was a theme to this conference on many topics, it was the positive approach to problem-solving for cruising folk, and the first presentation by Paul Scannell and Mary Healy - on how they have taken to prudent sea coastal cruising with their formerly inland waterways 41-year-old Broom 37 motor-cruiser Arthur – provided much of practical interest for sail and power enthusiasts alike. The harsh reality of the open sea at its most aggressive was the topic of Kylie McMillan’s presentation, which stemmed from her role as a crew-member aboard the J/109 Jedi when they’d a man-overboard situation off the west coast in strong to gale northerly headwinds during the 2018 Volvo Round Ireland Race. The exemplary and speedy retrieval controlled by First Mate Kenneth Rumball of the Irish National Sailing School has deservedly been awarded the RORC’s Seamanship Trophy, and Kylie’s gripping account of the experience brought the whole event to life. The other side of sea rescues was then explored by Keith Devaney, Technical Crew Manager of CHC Helicopters who run the five state-of-the-art Sikorsky S92s on behalf of the Irish Coastguard. Keith is responsible for all 37 technical crew (the Winchmen) in the service, and after the self-help Jedi presentation, the air-sea rescue view was an intriguingly different angle. Experienced cruising sailor Vera Qinlan of Kinvara will be taking a 15-month Sabbatical to do the Atlantic circuit cruise with her family. The morning session was completed with experienced cruiser Vera Quinlan of Kinvara on Galway Bay (she has been sailing since the age of 10) presenting an informative video on her plans to do a 15-month Atlantic circuit cruise with her family – including Lilian (11) and Ruari (9) - on their Bruce Roberts-designed Mauritius 43 Daru. As she works in the INFOMAR programme with the Marine Institute, although she’ll be taking a career break it will be with a professional flavour, surveying sea conditions and placing an oceanographic buoy along the way. After a sociable break for an excellent lunch, the ecological conditions of our oceans was very much the theme of the first afternoon speaker, ocean racing legend Damian Foxall, who has recently been appointed Irish Sailing’s Sustainability Ambassador. His CV in completing 10 round-the-world races with its close-up experience of the increasingly polluted state of our oceans now informs his entire approach to environmental matters, and he was passionate in his determination to make all sailors aware of the roles they have to play in reversing the trend. One longterm development which will be significant in this is increased use of electric power as the basis of marine engines. But for most boats, the contemporary reality is still the standard internal combustion engine started by battery power. Toni O’Leary of Union Chandlery is typical in that her classic Contessa 26 in Cork Harbour has the diesel engine with battery support combination. As Technical Sales Supervisor with Union Chandlery for the last 16 years specialising in the electronics, electric and marine hardware divisions, she was able to give the best advice about proper on-board battery management, still an area of mystery to many boat-owners. Norman Kean’s contribution was naturally well spiced with his own salty wisdom as a hugely-experienced cruising man, one who moreover is never reluctant to give his clear and sound views on the vast array of nautical topics with which he is fully conversant. But after he’d outlined the problems with fuel sourcing for recreational boats on Irelands remoter coasts and the apparent official indifference to it, some of the less dedicated attendees might well have wondered if the sometimes intangible benefits of cruising outweigh its many challenges. This question was almost immediately answered by the final speaker, Niall Hatch of Bird Watch Ireland, whose guidance through the coastal birds of Ireland and their identification was a reminder of the many rewards of cruising at its best, though he also gave forceful reminders of the hazards of plastic waste. That said, we take it for granted that the close and easy sighting of seabirds in their element is part of every cruising day, just as we’re almost blasé about the regular appearance of whales, dolphins and porpoises off coastlines of breath-taking beauty, but Niall Hatch’s presentation was an eloquent reminder of the special pleasures cruising provides. Thus this friendly conference – which had seen every presentation followed by insightful questions from the audience - concluded on a specially pleasant note which sent everyone on the road home with their interest in cruising well refreshed. As Gail MacAllister admits, they may have tried to pack too much into the busy day. But there wasn’t one item anyone would wish to have removed. And thanks to the sponsorship of Union Chandlery and Kilrush Marina, with additional support from UK Sails Ireland, Aster Yachting, W1DA, VHF.ie-training, and the Irish National Sailing School, it was a comprehensive success, buoyed up by the unstintingly friendly and very hospitable approach of Lough Ree Yacht Club. The Irish Sailing Cruising Conference heads inland this year so that sailors from around the country can join each other for a day of speakers, presentations, storytellers and a social lunch. Lough Ree Yacht Club is known for their warm welcome and excellent facilities and will be hosting the conference on Saturday 16th February, 11 am to 5 pm. Taking care of our oceans and waterways is an international concern and has a direct impact on our sport and lifestyle. Round the world ocean sailor and 11th Hour Racing Sustainability Manager in the 2018 Volvo Ocean Race, Damian Foxall, will give an insight into sustainability and the changes Volvo Ocean Race made. And to compliment Damian, Niall Hatch of Bird Watch Ireland will be discussing the lives of our incredible range of coastal birds and giving tips on identification at sea. "Niall Hatch of Bird Watch Ireland will give tips on identification at sea"
Ocean going sailors will be intrigued by the story of Paul Scannell and Mary Healy’s cruise round Ireland (very carefully!) in a 41-year-old inland waterways vessel. We all know how lumpy it can get out on the west and north west coast and these guys really know how to read weather charts and go when the going is good. “It is all about the prep and good crew.” says Paul. Man over board is always a big concern and when one of Kylie McMillan’s fellow crew members fell overboard at night while racing round Ireland, the importance of having a plan and good training probably saved a life. Following requests from last year, Technical Crew Manager Keith Devaney and Chief Crewman Benny Meehan will be presenting on how to manage a helicopter lift. Vera Quinlan is preparing to sail the Atlantic circuit with her two children under 12 and will be sharing a vlog on the work involved. Battery management is a big issue in this age of numerous tablets, phones and electronic equipment on board, so Toni of Union Chandlery will give everyone some advice on battery management on-board. And Norman Kean will bring everyone up to date with the most recent developments in leisure craft diesel and the impact it has on coastal sailing. Tickets for Members are at a cost of €25 and non-members €30 (plus booking fee). Cork Institute of Technology (CIT) has scooped an Atlantic Project Award for its work in leading the Cool Route project. This year’s Atlantic Project Awards were presented today (October 23rd) at a prestigious ceremony at the 5th Atlantic Stakeholder Platform Conference in Vigo, Spain. The Atlantic Project Awards, established in 2016, are designed to honour outstanding success stories achieved by projects in the geographical area covered by the Atlantic Strategy that showcase relevance to the implementation of the Atlantic Action Plan. They promote individual winners and at the same time highlight the incorporation and scaling up of best practices at regional, national, European and international level. This project was funded by the Northern Periphery and Arctic Programme. The 2018 Atlantic Award recognises CIT’s work in Creating a Socially Inclusive and Sustainable Model of Regional Development. The Cool Route project 2015-2018 is led by CIT’s Hincks Centre for Excellence in Entrepreneurship and had partners in Ireland, Northern Ireland, Scotland, the Faroe Islands and Norway. The Cool Route addresses the development of Marine Tourism, through the provision of small pontoons and marinas in peripheral coastal locations, which facilitate visits from all types of vessels, ranging from small private craft to liners. Even very large liners regularly disembark marine visitors using ship’s tenders. The project successfully completed a wide range of research into all aspects of is objectives. Accepting the award on behalf of CIT from EU Commissioner Mr Karmenu Vella, Dr Orla Flynn, CIT Vice President for External Affairs, praised the staff at CIT and their Cool Route partners around the Northern Periphery and Arctic Area for securing such an excellent recognition of their work and added that she is very proud of the role which CIT has grown and developed throughout the European Union as a partner of first choice in many European Programmes. Dr Flynn advised Commissioner Vella that CIT works with European partners in over 100 different regions covering every EU Member State. CIT also has very active engagements in South East Asia, the USA, and Canada, placing it on a global stage in terms of International Research and Education. “CIT’s global reach in terms of academic quality and research is also mirrored by the significant numbers of International students studying at CIT, which offers a very wide range of courses in many disciplines ranging from level 6 to level 10. CIT and the Institute of Technology Tralee are due to merge to become the Munster Technology University and today’s award will have pride of place in that new Institution” said Dr Flynn. Is Ryanair Bad News for Sailing in Ireland? Is Irish sailing heading south? Are significant sectors of the national fleet heading for new home berths in the Lotus Lands asks W M Nixon. Every Autumn, we hear of boats which have headed down to southern Brittany or southwest France or northwest Spain, and they not only find a pleasanter summer climate on attractive coastlines with fascinating local culture, but they discover marina and boatyard costs – sometimes thanks to active government subsidies – which are much more manageable than at home, while the facilities, especially as regards boatyards, are often better too. So when the owners and crew tot up the figures, it seems to be a No-Brainer. Thanks to the Ryanair Effect, they reckon the boat should stay right there. With Ryanair and other budget airlines, we’ve had one of the greatest revolutions in modern life - the ready availability of genuinely cheap air travel to formerly relatively obscure and inaccessible areas. And thanks to it, berthing your boat abroad in some attractive cruising area to the south can actually be a money-saver. Thus we might argue that Ryanair and its rivals are damaging domestic Irish sailing as we have known it for decades, indeed for centuries, by enabling an important focus to move elsewhere. At traditional Irish sailing’s core, there was the expectation that your boat and your sailing would be within easy reach of home. But it seems that this might have started becoming too much of a good thing. Ready availability may seem a fine ideal, but could it be that the same old sailing just down the road at the same old place, and racing against the same old people, was making participants just a little bit jaded? And then there’s the unpredictable Irish weather. We may have had an exceptionally “good” spell of weather in 2018 in June and July, but anyone with a feeling for Ireland as a whole realised this was freakish. Ireland simply doesn’t suit having endless sunshine and totally rainless conditions week after week. Anyone who cares about the real Ireland became increasingly uncomfortable with conditions which not only were seriously damaging for agriculture and other things central to Irish life, but it also diminished the benefits of sunshine and a feeling of wellbeing when you did finally got away yourself on the holliers. In short, good weather at this ludicrous level was unnatural. And often, for sailing, it was windless too. But is this the way our climate is going whether we like it or not? Windy wet winters, and dry, windless, mind-numbingly bright summers seems to be a fairly widely-held prediction among climatologists. Some folk might think it heaven, looking forward to such a thing. But for anyone trying to work, more temperate summertime weather is the better proposition. And as for rising temperatures globally, apparently, the effect is as though Ireland is moving south by four kilometres every year. And it has been going on for maybe as long as sixty years. Which is comfortably within living memory. It means that for many of us, the Kinsale we knew as kids is long gone - today’s Kinsale is by comparison somewhere down around the balmy Isles of Scilly….. Certainly, it felt like somewhere very far south indeed of the Isles of Scilly, let alone the Kinsale of our youth, when I was there in July. We were yarning with the crew of a cruising boat from Rush, and our most immediate problem was to get comfortably out of the sun to discuss what cruising folk from one area often do when they meet up with another crew from the home coast – in this case, there in the shade with the sun blazing down on Kinsale, the main topic was developments on Lambay, our own local “big island” off the Fingal coast. Equally, when some of the many Ryanair-facilitated Galicia-based Irish cruising boats meet up with another boat from their own port out in their adopted corner of sunny Spain, the talk is as likely to be the latest news from home as much as it is an exchange of tasty information about an interesting new harbourside restaurant just up the coast, or a good new marina-and-boatyard which is offering an even better deal than the one they have been already been enjoying for a couple of seasons. Either way, while you might reasonably suggest that Kinsale in the July sunshine was every bit as attractive as northwest Spain, there’s another key factor. 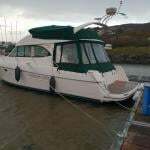 Keeping your boat for at least a few seasons somewhere else, with good sailing in the sun, gets you physically out of Ireland. For sure, you’re still reachable by the mobile. But there’s something about that magic moment when the rubber leaves the runway at the start of your hopefully brief and efficient journey to join the boat which is the true signal of breaking free from the day-to-day concerns which are ever-present when all your sailing is done in Ireland. Of course, purists will argue that you’ve only really earned your break if you’ve sailed out to Spain or France or wherever, and in the case of the significant group of Irish boats in northwest Spain, for many of them it all started with last year’s Irish Cruising Club Galician Rally with sixty boats, organised so efficiently by Peter Haden and his team. His home port in Ireland is Ballyvaughan on the south shore of Galway Bay, but for many seasons now his Westerly Seahawk Papageno has been Galicia-based, and his acquired local knowledge of the coastline is of high quality. Shared with fellow ICC members in such a positive way, it speeded the development of the Ryanair Effect, such that some estimates of the number of boats sailed out from Ireland which simply stayed on in northwest Spain after the rally go as high as 40%, which is a significant depletion of the top end of the cruising fleet back home. And it’s accentuated when you realize that in cruising round the Bay of Biscay, you’ll almost always find Irish cruising boats semi-permanently based at useful ports with handy airport access in the best cruising grounds. Often, they’re based on syndicate ownership, which requires a high level of organization and an ability to live along comfortably with the needs and expectations of others, but then the people in these groups are accustomed to that in their professional and business lives anyway. When all these cruising folk from different areas meet up at some wintertime gathering in Ireland, in addition to the usual comparisons being made between the attractions of Inishbofin and Cape Clear Island, you’ll find insightful analysis of the appeal of the islands of the Vendee such as Ile d’Yeu and Ile de Re, or islands within the Ria area of Galicia behind the mighty headland of Cape Finisterre. But at such gatherings, you’ll also realize that the Ryanair Effect certainly does not mean that the folk who have links to boats in Galicia or wherever have dropped out of the Irish sailing scene altogether. On the contrary, with today’s long and hectic Irish sailing programme, they’re frequently afloat in some capacity in home waters when they’re not at their main boat in distant places. The sheer busy-ness of today’s sailing programme – a marked contrast to the leisurely schedules of the early 1900s – is now effectively year-round at some clubs, and it simply broadens the potential scope of sailing. Nevertheless, with so many other leisure-time activities promoting themselves towards today’s consumers, the diluting results of the Ryanair Effect on our sailing cannot be denied, and it continues to spread with those Irish boats to be found based along all the more attractive coasts of South Biscay. Add in the fact that although the Mediterranean a few years ago was being condemned as too crowded, the opening up of the newer cruising area such as Croatia has long since added yet another distant paradise with reasonably economical berthing options and good air links for Irish sailors, all of which can diminish the attraction of the packages available at home. As for Mediterranean sailing having an air of novelty, rather it was more a case of relative inaccessibility through the expense of getting there in a reasonable time. After all, the almost legendary CIM, the Commite International de la Mediterranee which regulates the area’s magnificent fleets of classic yachts, has been in being since 1926. And this year in just a week’s time, we have the Golden Jubilee of the Middle Sea Race, with a record fleet pushing towards 130 boats making that incomparable start out of Grand Harbour, Valetta. Fifty years of the Middle Sea Race? Yes indeed. But the fact that it is now factored into the sailing programme of many Irish sailors is due in no small part to affordable air travel, which has changed us from being a mid-size island seemingly remote on the edge of Europe into somewhere accessible which just happens to involve an extra hour in a jet plane. Like it or not, the Ryanair Effect is very much part of our modern sailing scene. Dave FitzGerald lived a hundred lives, and he lived them to the full. His exuberant zest in existence expressed itself in everyday life, in his notable career as a miner, and in his joy in sport - be it sailing, rugby or hunting. If any activity could be enhanced by what others might think of as a bit of mischief - however harmless- Dave would be game for it. Yet he had a serious side and could be a formidable administrator and manager when the situation required. Born in Kerry, he was the son of a railway construction engineer whose peripatetic existence took him worldwide, resulting in the young David FitzGerald often travelling considerable distances alone to join his parents when on vacation from school. His own underlying seriousness was indicated by his boyhood ambition to be a miner at international level. To achieve that, he graduated from the Camborne School of Mines in Cornwall, which had been built around the Cornish tin-mining industry, and from it, he went forth to work in the world after being the School Boxing Champion and playing rugby for Cornwall. Newly married to Jean, an early appointment was as manager of a chromium mine in Baluchistan in northwest Pakistan. It was wild country where he could hunt with a rifle, becoming fondly known as the Emir FitzGerald after he had out-performed the local chieftain in a sports shooting match. He claimed this was an unintended result – he’d meant to miss in order to maintain friendly relations. His mining contracts took him over much of Asia, Canada and South America, and he was 8,000 feet underground in the St John D’el Rey Gold Mine in Brazil (the deepest in the world) in its final profitable years around 1960, when he received a faint and crackling phone call from Ireland to see would he be interested in opening up a new zinc and lead mining venture in Tynagh in East Galway. It was a rare opportunity to do the job he loved in his homeland, and his arrival in southeast Galway was to set his life path for very many years, and affect all those who got to know this remarkable man as he played a key role in bringing previously unimagined sources of income to an otherwise impoverished area. As a sportsman, he naturally looked about for ways of attracting others to his areas of interest, and after trying to get a sailing club to thrive on the lake at Loughrea, he and fellow enthusiasts like the late Dave Whitehead reckoned that Galway provided the most likely opportunities. But he had the energy of ten men, and in addition to early attempts at getting sailing going on Lough Atalia within the city, Dave was much involved with Corinthians Rugby Club in the city, actively playing the game until well past the age when most men would have long since hung up their boots. He continued to be concerned that the Galway city area was not availing of its great sea sailing waters, and he played a leading role in persuading Galway Bay SC that the future lay with a base at Renville near Oranmore. He led the way by acquiring a Snapdragon 26 called Pegeen on Dublin Bay, having usefully discovered that the Irish railway system still operated a prehistoric pricing system for the transport of boats on its flatbed trucks. Pegeen being twin keel, she was ideal for this, and it cost him only seven shillings and sixpence (about 40c in today’s money) to have her transported from the Point Depot in Dublin across Ireland to the quayside in Galway city. Berthed at the little quay in Renville, Pegeeen was the beginnings of what is now the sizeable and modern Galway Bay SC fleet, and with her Dave played a key role in the club’s growth, introducing others to sailing even as he learned more of cruising the West Coast of Ireland until in 1966 he introduced a new thread to sailing in the bay by being elected a member of the Irish Cruising Club. He was to go on to become the ICC’s first western-based Commodore, introducing many other new members of similar quality to the club. Yet while he was a great man for a party, he was equally renowned for the thoroughness of his approach to administration and management – longtime friend Pierce Purcell recalls how at GBSC committee meetings when Dave was the senior officer, he kept a little notebook in which he personally noted what each committee member had agreed to achieve before the next meeting, and the thought of the quietly probing question at that next meeting invariably ensured that the required action had been taken. Yet this same serious administrator could be the life and soul of any party. While Commodore of GBSC, one of his duties was to be Santa Claus at the Christmas special, and in December 1981 he arrived into the clubhouse with the full Santa gear astride his hunter, demanding a whiskey for Father Christmas and a pint for the horse……. As for work, while he was a demanding mine manager, he was deeply into the lore and culture of mining, and his favourite party piece was singing the miners’ anthem, The Ballad of Joe Hill. He sang it very well indeed with true feeling, and longtime friend and shipmate Peter Fernie recalled that sometimes, for extra effect when still in his prime, he sang it while standing on his head. It was remarkable that a man so busy with work and so involved in sport and socialising was also much immersed in family life with Jean and their three daughters Grainne, Trish and Kathy, but Dave FitGerald was a devoted family man who was to go on to adore his grandchildren, while of his daughters it is Grainne who has most enthusiastically followed his delight in sailing, and particularly in cruising. She has become a leading figure in the Irish Cruising Club, having served on the Committee, then for a period as Honorary Secretary – a notably onerous task with such a diverse and widespread organization – and now she is back on the strength of the Committee while - with her partner Chris Curry - she ensured that Dave continued to sail well into his eighties. Dave’s own boat-owning career followed the familiar path of gradually increasing in boat sizes as resources and physical powers permitted, and then easing back as the reality of the years took their toll. The little Pegeen was used to the maximum including an award-winning cruise to France, and then he moved up to the Fulmar 32 Pegeen Eile which – with Dave’s enthusiastic crews - proved well able for the challenges of Ireland’s Atlantic seaboard. His largest craft was the one-off Holman & Pye-designed 40ft Partizan, whose crew needs well served his personal aim that anyone who turned up on the Galway Bay SC slip on an evening of the weekly league, and hoped to sail, would quickly get a place. As with his other boats, Partizan provided a welcoming berth on board for newcomers, and as helpful an introduction to sailing as could be managed by people whose zest for sailing sport was more than matched by their enjoyment of life in general. Partizan emerges from the dawn off Wicklow to take second in line honours in the first Round Ireland Race in 1980. With Partizan, Dave FitzGerald gained a place in Irish sailing history through being one of the eleven entries and taking second in line honours in the first Round Ireland Race from Wicklow in 1980, a ground-breaking event he did with such such seasoned shipmates as Denis Cudmore from Cork, Pat Fahey of Galway, Philip McAuliffe (then of Galway, now of Cork), Frank Larkin of Limerick and others. This ambitious project introduced a period when Partizan was a regular participant in events near and far, with Peter Fernie soon adding to the strength to provide Dave FitzGerald with the skilled and congenial ship’s company which made possible an extraordinary programme which almost invariably involved Partizan making an annual round Ireland passage, whether racing or not. Indeed, for a Round Ireland Race, she inevitably went round Ireland twice. With time moving on, Partizan was becoming too demanding and a newer boat was needed. Dave FitzGerald made a very sensible change to the masthead-rigged Sigma 36 White Heather, which proved ideal for his needs in Galway Bay, yet was well able for longer distances, including a cruise to Spain. But even for Dave FitzGerald, the pace had to slow. He’d retired from actively working in mining with a farewell party which is still the stuff of legend, and when Joan passed on after they’d lived for many years near Kinvara in Galway Bay’s southeast corner, he accepted that the focus of his family was now in the Dublin area, and settled in comfortable quarters near the south shores of Dublin Bay. But his huge network of friends was maintained, albeit depleting by the year, and he maintained a lively interest in boats and sailing and club life to the end. His 90th birthday was celebrated at the end of January this year by a party of forty family and friends from mining, sailing and hunting at a special dinner in the library of the Royal St George YC in Dun Laoghaire, rounded out by the birthday boy giving a soulful rendition of The Ballad of Joe Hill, and then telling everyone that if he’d known he was going to live so long, he’d have taken better care of himself. Dave Fitzgerald at his 90th birthday party, January 2018, with (left to right) Tom Foote, Peter Fernie and Pierce Purcell. Now this great man is gone from among us. His funeral was held in Dublin on Friday, and then he was laid to rest in his home parish of Ardrahan in southeast Galway on Tuesday (May 29th), with the wonderful life of Dave FitzGerald celebrated by a congregation which well represented his many interests afloat and ashore, the attendance including Irish Lights Commissioners Chairman John Coyle, Galway Harbour Master Brian Sheridan, Michael Swan of the RNLI, and leading representatives of yacht and sailing clubs in the west and nationally including the Irish Cruising Club. Single-handed sailor Mervyn Wheatley was taking part for the fifth time in the Observer Singlehanded Transatlantic Race (OSTAR) to raise funds for The Royal Marines Charity when he encountered hurricane force winds and massive 15m waves in which his boat was capsized. Although it righted itself, it was a shambles, full of water, the steering had failed, all the electrics had ceased and she was taking on water. He had skippered several legs in the Clipper Round the World Race and this would have been his 19th Atlantic Crossing. At the age of 73, the immensely experienced skipper with more than 400,000 miles beneath his keel, made the ‘traumatic decision’ to sink his Formosa 42, Tamarind, to prevent a hazard to other ships and to accept the hospitality of the Cunard Ship the Queen Mary 2. He was rescued thanks to "excellent seamanship" by a tender from the ship, which had been en route to Halifax, Nova Scotia from Southampton. The Ocean Cruising Club recognised the exemplary seamanship shown by Captain Wells and his crew, so invited him to their Annual Awards Dinner aboard the SS Great Britain where he and Mervyn were reunited for the first time since the Queen Mary 2 docked in Halifax. Both their wives were among the many who applauded as Mervyn presented Captain Wells with an OCC Special Award in thanks for his timely actions. Mervyn gave an eloquent and entertaining account of the rescue attempts and how his vessel managed to T-bone the QM2 then scrape along her sides, gouging tracks along the perfect paint until a tender was launched to pluck him from the sea. He then enjoyed the full hospitality of the luxury liner, which he admitted he could get used to. After he received his award, Captain Wells warned the 135 attendees at the OCC Dinner not to tempt fate in order to obtain similar favour from the Cunard lines. He said it was not worth the risk. He continued to note that Mervyn Wheatley is so experienced that it was a pleasure to come to his aid. Captain Wells, Master of the Queen Mary 2 said, "I am honoured to be reunited with Mervyn. He is a highly experienced mariner and was hugely unlucky to have been hit by such a large wave, I was extremely glad we could help get him back to shore safely."